Also zenka fuza 全跏趺坐, or abbreviated to zenkaza 全跏坐, kafuza 跏趺坐, kaza 跏坐. The full-lotus position; the seated, meditation posture of a Buddhist image. Both legs are folded such that the tops of the feet firmly rest on the thighs of the opposite legs. Many Buddha *nyorai 如来 and bodhisattva *bosatsu 菩薩 images maintain this position and it is considered to be the most stable posture for meditation. There are two types of full-lotus position: kisshouza 吉祥坐 (the seat of good fortune), in which left foot rests on the right thigh and the right foot is folded on top and placed over the left thigh, and goumaza 降魔坐 (the demon-subduing seat), in which the feet are reversed with the left leg on top, resting on the right thigh. 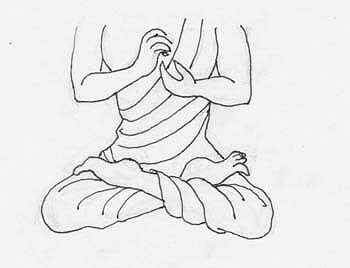 In many cases the hands of an image in the full-lotus position rest in the lap in the *zenjou-in 禅定印 (a hand position with palm open). The position of the hands, right over left, or left over right, corresponds with the leg that is folded on top in either the kisshouza or goumaza position. In India the first images in the full-lotus posture were seated in the kisshouza, which is therefore considered to be the original form of this pose. Chinese and South-east Asian examples of the full-lotus position from the 5-6c were also in the kisshouza. From the 7c onward both the goumaza and kisshouza were used in China. In Japan important examples of the figures in the goumaza date from the Nara period, for example the *Amida 阿弥陀 and *Shaka 釈迦 in the wall paintings of the *Kondou 金堂 of Houryuuji 法隆寺 and the central image of the *Yakushi 薬師 at Yakushiji 薬師寺. In the early Heian period many esoteric Buddhist images used the kisshouza, which is said to be due to the influence of esoteric manuals and drawings brought from China. Nevertheless, from the Heian period onward, both types came to be used equally.